If you're roof is leaking, we can help. 59 years of roofing knowledge, experience and integrity. If you hear a dripping sound or suddenly notice a brown spot on your ceiling, that's a good indication you may have a roof leak. In many cases, by the time you discover the leak, the damage has been going on for days, weeks, months or years ... so don't delay checking it out. The longer you put it off, the more serious the damage (and the cost) can be to repair the resulting damage. If you wait too long, you may be faced with replacing your entire roof, AND repairing the resulting damage to interior finishes (drywall, paint, and in some cases, structural components) of your home. Think a little leak is no big deal? 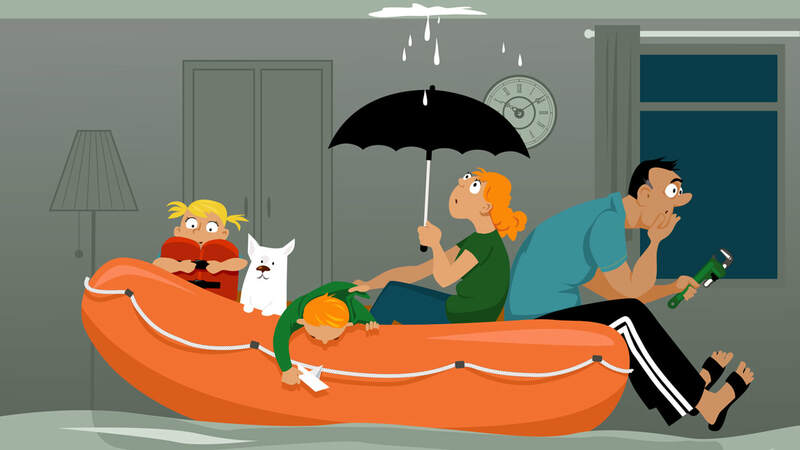 Roof leaks can cause damage to electrical appliances, making them fire and electrocution hazards. Excess moisture can also encourage the growth of mold and mildew, which can trigger health problems like allergies, asthma attacks, and upper respiratory conditions. Got a leak or think you do? Here's what we'll do. We'll meet onsite with you, the homeowner. We'll provide you with an extensive evaluation to identify the leak and the cause. Next, we'll provide a detailed estimate explaining our recommendation and cost. Any work we do comes with a 2-Year Guarantee. You can send us an email, but if it's an emergency, call us!